Climbing is primarily a head game, admitting that you are in it for that moment of thrilling panic, as your breathe deepens and you face the only option, commit or fall. Crossing that line in the sand and facing life at its most primal, fight or flight! In that moment its not your strength or fitness that will get you through that dark alley, but you mind. The thing is that today, you believe, you believe that you can do this, you’ve been climbing well all day. Each route a step up on the last one, you saw someone lead the route the last time you were at the crag, you know there’s gear above. A distant voice says ‘go for it’ as your stomach sinks. At that moment you move on and discover a new place, that ephemoral moment. There are numerous theories, ideas, research and intervention that can at the very least make you aware of some of the components success or failure. This first situation could be numerous times in my climbing career that I have experience, be it when mine or someonelses confidence shines. This incident though occurred just after I heard of Bandurra, and his thoery of self efficacy. ….“Self efficacy refers to beliefs in ones capabilities to organize and execute the courses of action required to manage prospective situations. Efficacy beliefs influence how people think, feel, motivate themselves and act” Bandurra (1995). In laymens terms efficacy is self confidence within a given task and/or environment, that given how confident we feel at that precise moment of commitment is linked to the choice of activity we choose, do we commit or back off? The amount of effort and persisitence we give to an attempt under the threat of failure, even how we think about the climbing and our emotional reactions. Research has tracked down four main building blocks of self efficacy which in order of influence are prior performances, vicarious experience, verbal persausion and arousal level. What Bandurra theorises is that if you develop the building blocks of efficacy then it increases your own personal beliefs in your ability to achieve your goals, and then you can start to realise those goals. Science aside I have witnessed many days when a series of progressively harder and harder routes have lead to the successful ascent of a new grade of a climbers, none more so compelling than just after I had seen the diagram of the building blocks of self-efficacy. I had arranged to meet up with two climbers Hazel and Sarah, I had never met them before, in the emails we exchanged I had come to know that they want to push themselves on Slate, and that they had previous lead E2. Unlike teaching beginners these guys were climbers though, and at some point you need to accept the risk. As we warmed up on a few sports routes I started to climb and point out a few things they could do to save a bit of energy, but other than that there was minimal ‘traditional’ coaching. Instead I used a progressive approach, making each route harder than the last. Eventually the girls decided that they both wanted to lead a burly E2 laybacking crack. I sat back and observed from a distance, Sarah the first person up looked a little shakey on the lead but managed it fine when she choose to commit. Hazel on the other hand climbed it smoothly and in control. Now I know there is an argument for having a visual beta, but under Banduraa’s theory this would be classed as vicarious experience, in that you saw someone achieve your goal, and an inner voice has turn round and said ‘I can do that’. On its own that observation was nothing to write home about, however on the second route the order was reversed. So first up was hazel, this time she was the shakey one, and Sarah climbed with a lot more grace and style. The second route was a bit more complex than that though, as well as looking at the vicarious experience, I was assuming that the previous routes would have also bolstered there confidence as a perforamnce accomplishments. On top of that I also started to turn the cogs of verbal persuasion The route was an E3 in the guidebook and the look on the two girl’s faces and body posture changed, E3 to them was a big thing. They undoubtably had the skills and ability to lead this route but the anxiety of breaking a new grade was undermining their confidence. So I told them that as one of the authors of the fourthcoming guidebooks to the area we were downgrading the route to E2 5c, rather than E3 6a. After explaining why we downgraded the route, I climbed it and tried to make it look as easy as I could. By now the colour had return to their faces, and after climbing the route successfully, I re-awarded them with the E3 tick, for which I receive two very big smiles, for a coach there is no bigger reward than the overt satisfaction of people you work with. My next stop was to see where exactly I could go with this, so we went on to another E3, this time I told them the grade, climbed the route, and them let them both lead it. The next day one of them climbed Comes the Dervish, they both had “the best weekend climbing”. I did tell them a week later that I had observed and to a certain extent helped the process along by choose rotues to help develop there confidence in stages, both were fine with it, but the real question was it all because of self efficacy? Whether it was or not, the main thing is that improving you self efficacy is so easy that you probably do it already, what this and the following articles want to highlight are ways that modern sports psychology can be used to increase our climbing performance. The lessons to take from this, and the lessons we are going to cover over the coming months are going to address ways that we can build the four building blocks of Bandurra’s Self-efficacy or your confidence in a climbing situation. The easiest way and by far the most powerful way to increase efficacy is by using your previous accomplishment to build up in a steady progression. It is a delicate line between make too rapider progression and failure or too slower progression and stagnation. Get it right and everything works for you, over step the line and the wheels will quick fall off the wagoon, and you will undoubtably have a negative effect on you confidence. The trick is to know you ability, know the routes you want to climb and then create a step by step approach to your route. Be it routes of similar style, length, difficult. If you have a route as a goal then you will probably have done your homework and know the demands through reputation. Later in the series we will cover goal setting, but as a starter concerntrate on process goals, like feeling comfortable on route of certain grades, climbing efficiently or placing gear rather than success or failure on specific routes. As well as recent performance expriences it is possible to recall through a process of imagery prior performance. Whilst we don’t cover this specifically when we address imagery, the ability to visualise prior performance experience can help reinforce confidence and even reduce anxiety. Like your performance accomplishment, vicarious experience can be gained both directly from observation of both your friends and others, but also through visualisation. 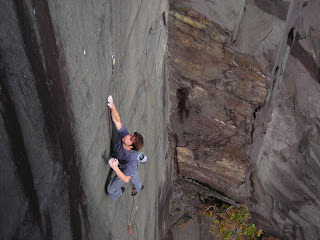 One of the mechanisms that it undoubtably works through is our natural behaviour to judge performances against our own ability, so whilst watching someone who you percieve as better than you will still help to increase your efficacy, you often gain more when you witness someone who you percieve as the same level or even worse than you at climbing. The reason being that in the latter situation you mindset will change to, ‘if they can do it, so can I’. In terms of real observations and the ethics of watching someone climb route prior to climbing it, many of the elite climbers of today work to a strict on-sight ethic, where they try and insist that they have onsighted the route, only in the rarest of circumstances is this true. They will have undoubtably acculumlated some vicarious experience, be it through watching a friend, or having someone elses description of the route by which they judge their own potential to perform. The only thing that is inportant ethically is that you are true to yourself. For most of us verbal persuasion will come from those around us, be it belayers or friends you are climbing with. The right thing said at the right time can have really positive effects on your performance, verbal encouragement has been shown to improve performance in a variety of laboratory settings as well as in real life situations. You can try this out yourself, next time your at the wall try traversing on a angle of wall that will result in failure, firstly traverse back and forth until you reach failure but have no one you know with you noting down the time you can hang on for, the next time you try, either after a substanial rest or on another visit, go with your friends and get them to call out lots of encouragement as see if you last longer? I tried this exercise on a few young climbers, two of climbers almost doubled the amount of time they manage to climb for. This link to encouraging to success, can be equally linked to negative encourage whether that be through the direct communication of what you belays says to the more subtle language of their body or facial expression. As a belayer it is an import to remember that and remember that in giving someone the time to belay them, attentively, positively and with ethusiasm, should be repaid in kind by the climber. If it is not then consider climbing with someone that does. I have climbed a few times with people who seem to fill me with negativity, I think I only ever climbed with them twice. An obscure voice that often persuade us to carry on or give up is our inner voice. This chatter of our consciousness is what the boffins call this self-talk, and the research is in its infancy by comparison to other sport psychological interventions, but we won’t hear anymore about this for a couple of months. Arousal is a well researched area in sport, anxiety being one of the biggest obstacle and sometimes boosts to performance, as such research into the optimum aurosal levels for optimal performance in mainstream sports has created a drive to push research to answer some of these questions. 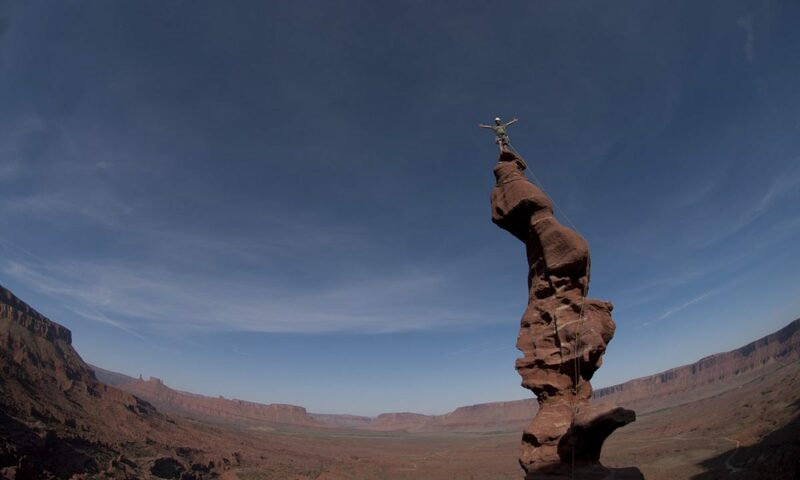 Some of this research has used outdoor pursuits and climbing as it is easier to manipulate the anxiety levels, by having people lead or top-rope. We will seperate our somatic from cognitive arousal and how these can effect our processing efficiency, conscious processing and even how they can cause performance catastrophies. On top of the causes and effects of arousals we will also examine ways to manage our arousal levels through relaxation, visualisation and self talk. The thing to remember is you are in it for that moment of thrilling panic, as your breathe deepens and you face the only option, commit or fall off. 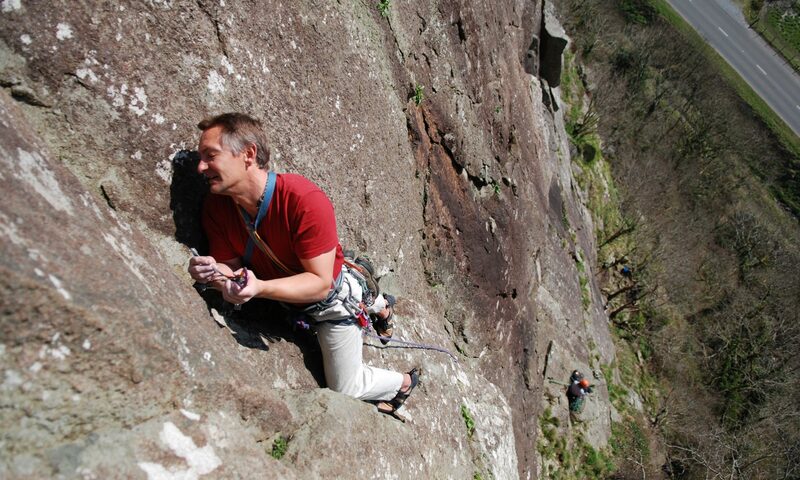 The author runs performance rock climbing courses at Snowdonia Mountain Guides. These courses use many different techniques including confidence building to help improve your climbing performance.